Good morning. Actually, it’s a great morning –> the Islanders shut out the Rangers! I am just sitting here about to enjoy my usual pre-run breakfast. Sometimes I add blueberries and I always add peanut butter. My son is on an oatmeal kick too. I give him the LOVE GROWN Super Oats (Nuts & Seeds variety) because he isn’t allergic to nuts like I am (remember, I have oral allergy syndrome. I am not anaphylactic but I do have reactions to walnuts and almonds so I am trying really hard to honor that and avoid them). He loves his morning bowl of oatmeal especially when I mix in the LOVE GROWN Cocoa Goodness Oat Clusters. I think the Cocoa Goodness tastes just like Cocoa Pebbles which was my favorite as a kid. Lately I have been on top of my Skoop A-Game by adding some (the Sweet Greens variety) to my post run oats in a jar. I am still working with frozen berries which is what makes the oatmeal/yogurt mixture look so pretty pink even though I have lots of fresh strawberries in the house. I have gotten so used to the frozen berries (blueberries, raspberries and cherries) that I think I may actually like them. I normally eat lunch at home during the week but on days where I can’t, I tote it along with me. Chick pea/avocado mash with roasted sweet potatoes, sugar snap peas and roasted brussels sprouts over spinach. Chick pea/avocado mash on one half and peanut butter on the other. It’s the perfect savory sweet combo for me and comes complete with side salad of plum tomatoes, spinach and roasted brussels sprouts. I really like something sweet at lunch. 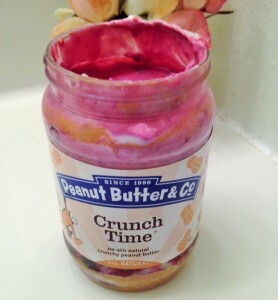 I normally save the peanut butter half for last, sort of like dessert. 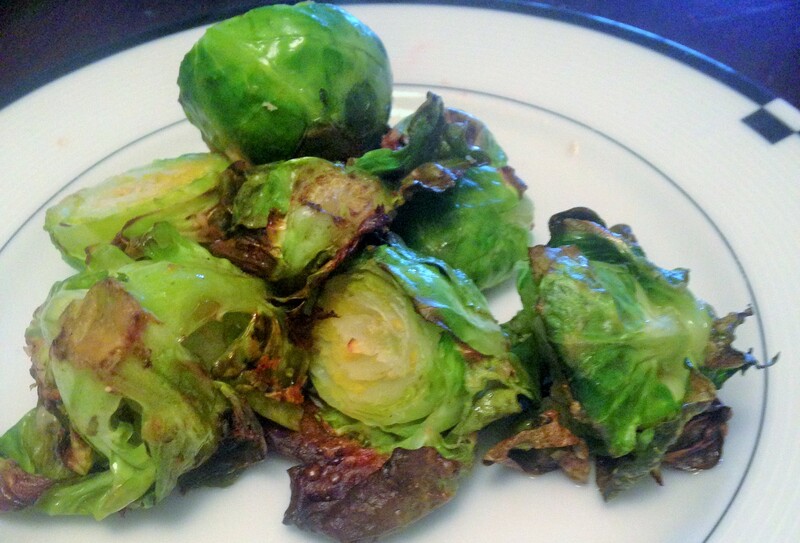 I am currently obsessed with roasted brussels sprouts by the way and I think it’s a great obsession to have. Always spritzed with coconut oil cooking spray, sometimes sprinkled with pepper, sometimes with just pure maple syrup, sometimes with maple syrup and Dijon mustard, sometimes with pepper and Dijon mustard and sometimes with honey mustard. 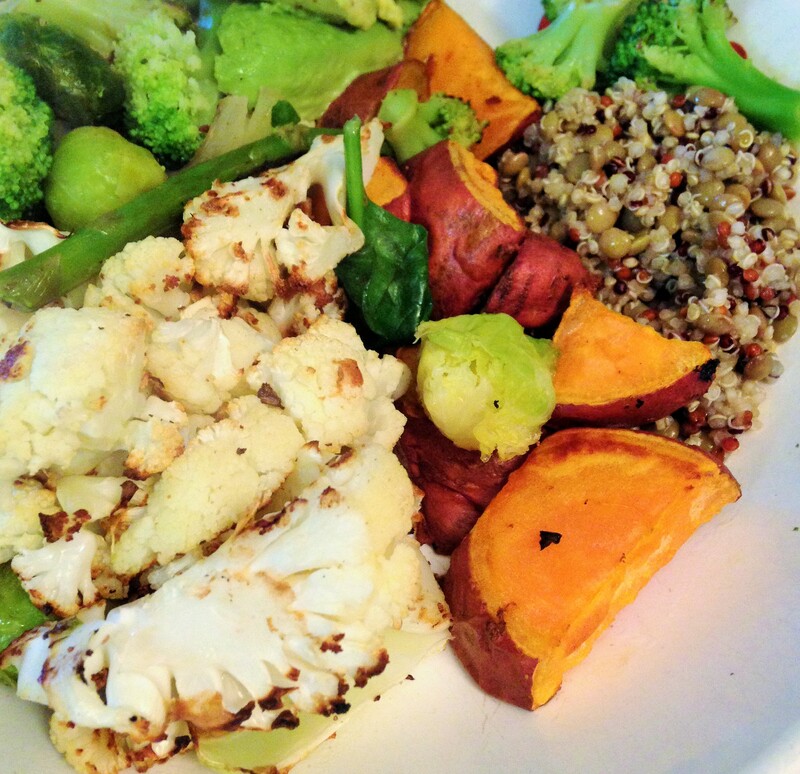 Dinner is usually easy because I can throw together a Power Bowl in a flash. Lentils cooked with tri-color quinoa, roasted cauliflower, broccoli and I think asparagus with sweet potato wedges and avocado. Remember the other day when I made those baked oatmeal apple sticks? 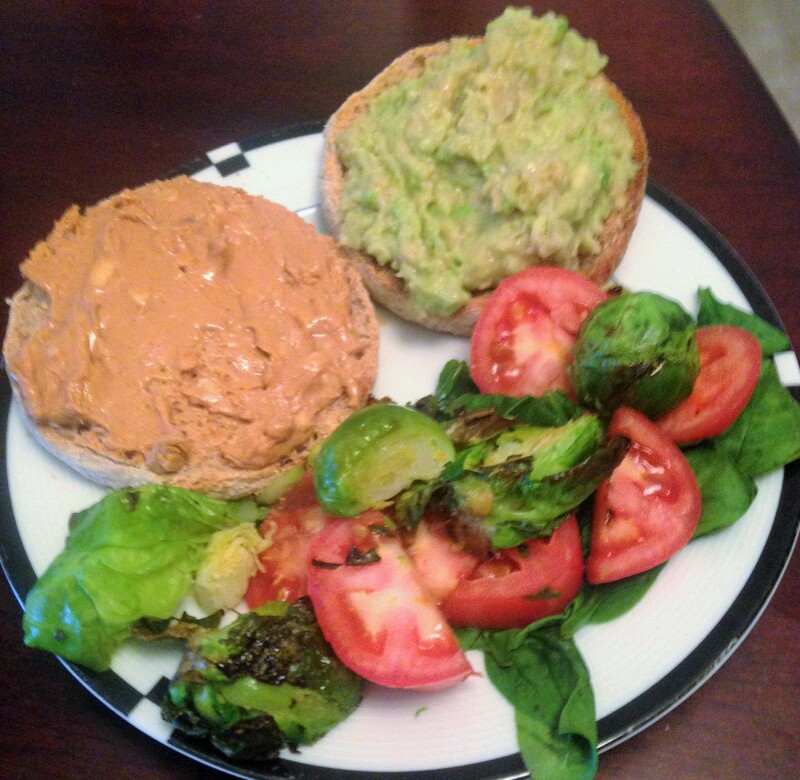 It’s a super simple snack and you can make it two ways – either using favorite nut butter or PB2. I can’t even say which way I like it better. I made it using Mighty Maple peanut butter one time and PB2 another and both came out really good. You hardly taste the peanut butter in either version, you just know you are eating something really special. The apples get soft, the baked oatmeal topping gets a bit crispy. Each bite is like a slice of apple pie but it’s healthy and comes together in ten minutes. *If using PB2, you may want to add more liquid - either another tablespoon of milk or water will do. Dice apple into slices that look like sticks. You can leave skin on or peel off, doesn't matter. Combine peanut butter (or pb2) with milk or water and a pinch of cinnamon in a microwave safe bowl and mix until combined. Warm mixture in microwave for around 20 seconds. Add oats and mix until combined. Spread mixture on to each apple stick and then place apple stick on lightly greased cookie sheet. Do you like something sweet at lunch time? 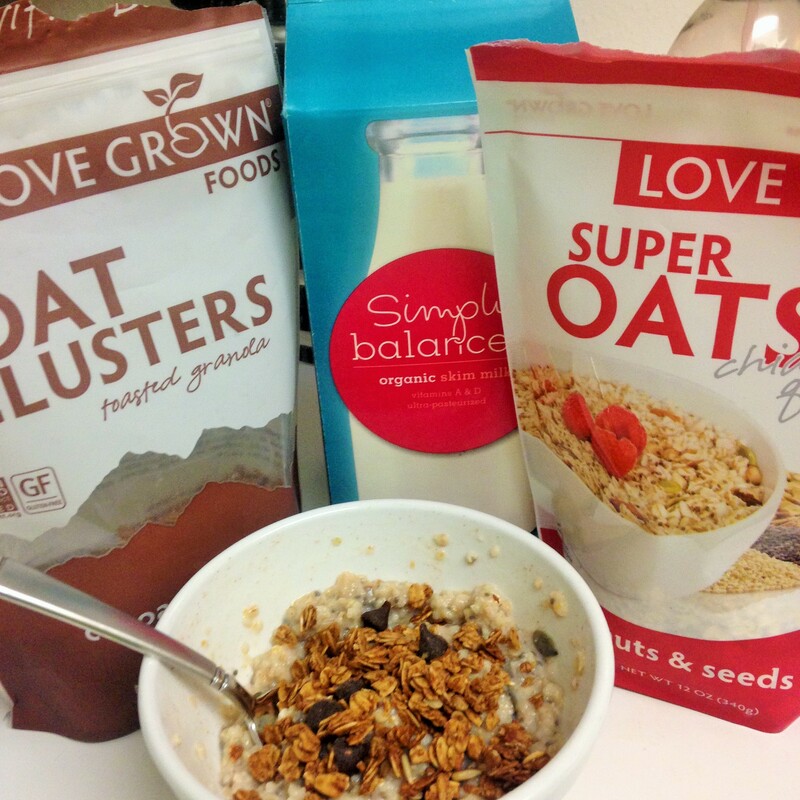 Which brand and/or type of oatmeal do you cook at home? I am SO glad I just read your blog, I was just about to reach for the cereal….again….but you have made me make a better decision and go for oatmeal! Thank you! Those baked apples, what a wonderful idea! YUM! Tina Muir recently posted…Be Brave, Be Strong, Be You! I really like the Trader Joe’s rolled oats. 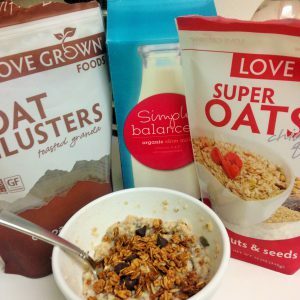 I didn’t like them the first time that I had them, actually, but now they are my fave–they are just much chewier than instant oats, so it took some getting used to. And I like the idea of the baked apples–like 2 bit apple crisp! I buy the Trader Joe’s gluten free rolled oats. I don’t love their steel-cut version so I get the Bob’s Red Mill (gluten-free) but John McCann’s is really good too. I always love your apple recipes. I actually thought of one of them the other day. I am definitely going to make this tonight. I always crave something sweet after dine. Let me know if you make it, we really liked it and it’s super easy. I mean, it’s just a twist on what I normally eat but it was really good and adds a drop of variety when I do things slightly different. Ha! Hate blue cheese, as you figured. First, I like something sweet most of the time, not only at lunchtime 😉 I like putting some nut butter with a little bit of honey mixed in on my Ezekiel Bread or English Muffin in the morning. So good. We do Trader Joe’s Gluten Free Oats over here. They are good and come in a huge bag for a decent price! I buy the gluten-free rolled oats too! So good! And yes, I want sweet all of the time, especially breakfast, lunch and at night after dinner. Very pretty color pink! 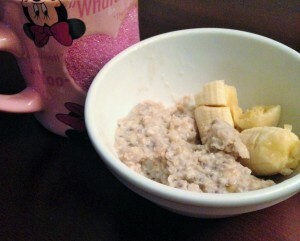 I’ve been having sliced bananas with lots of melted coconut butter if I really want something sweet at night. Other nights I’m weird and eat tuna with olives! Is it weird I never liked olives? I pick them out of everything. It’s awful if a salad I order comes chopped up and there are olives in it which I didn’t know about – otherwise I would have said no olives. 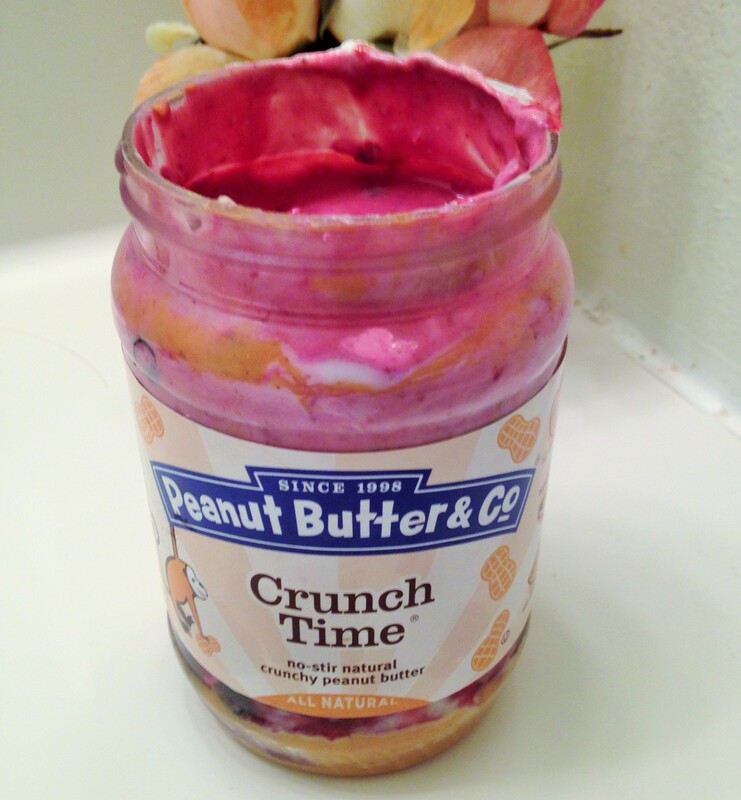 Lately I have been trying to do less nighttime snacks but when I need something its been fruit with cashew butter. The almond butter I have has added sugar which i didnt realize before I started the whole30 and sadly I can’t have PB. But cashew butter is a nice change of pace! 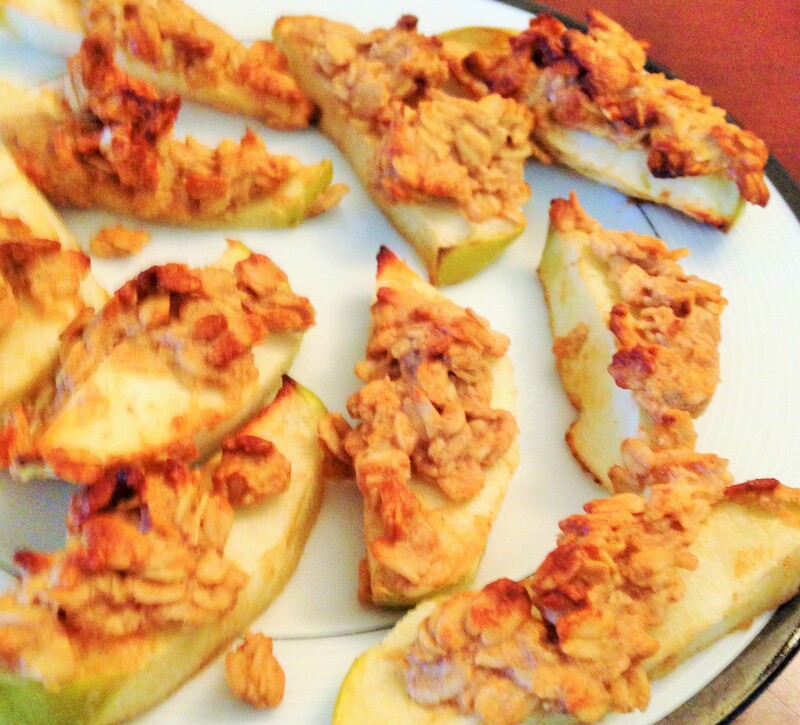 I also made baked apple chips which were a great snack. I saw those baked apple chips today in your post, looked really good! I couldn’t live without a nighttime snack. Just couldn’t. Haha, I love the picture of your salad in the car, I do the same thing! My meals will travel if I don’t have time to eat at home. I try not to eat in my car but sometimes we have to do what we have to do. Cocoa Goodness tastes like Cocoa Pebbles? Good to know! I think I may have already mentioned that we don’t have Cocoa Pebbles up here in Canada? I told an American friend we don’t have Fruit Pebbles either, and he refused to come visit 😆 People are pretty attached to their cereals. And I think that would probably be my favourite nighttime snack. Cereal with fruit, nut butter, and almond milk… left to sit so it gets kind of mushy. Amanda @ .running with spoons. recently posted…. cereal milk protein smoothie . You did say they don’t sell them but I didn’t realize that means you have gone thirty years of life without trying it at least one time while in the US at some point! I try to save my sweet treat for the end of the day or else I end up eating a sweets at every meal! I enjoy a good apple and nut butter as much as the next blogger, but I also like a small bowl of cereal or a hunk of dark chocolate. As of lately my late night snack has been popcorn. I guess I have been more on a salty kick. I love adding dark chocolate to my nighttime apple and peanut butter. It’s such a great combination. 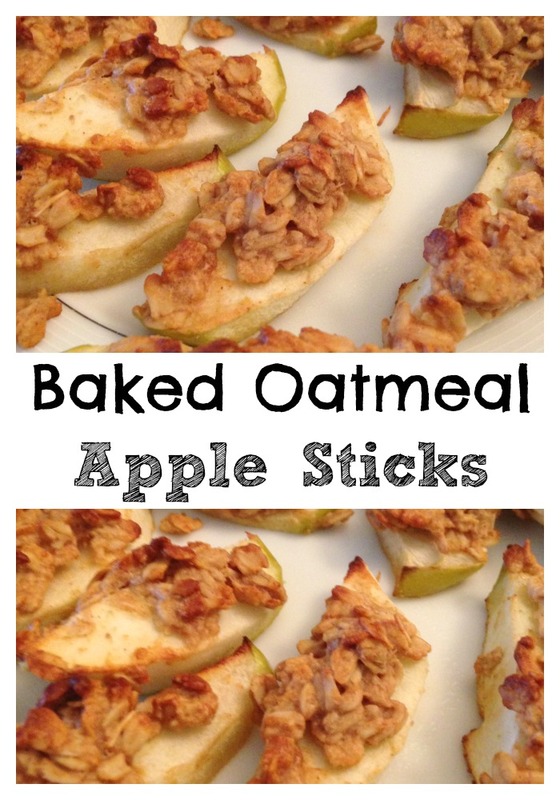 Those baked oatmeal apple sticks look awesome! I’ve heard that one of the best, healthiest desserts is some form of baked apple, so this fits the bill! So quick and easy to make and yes, super nutritious! 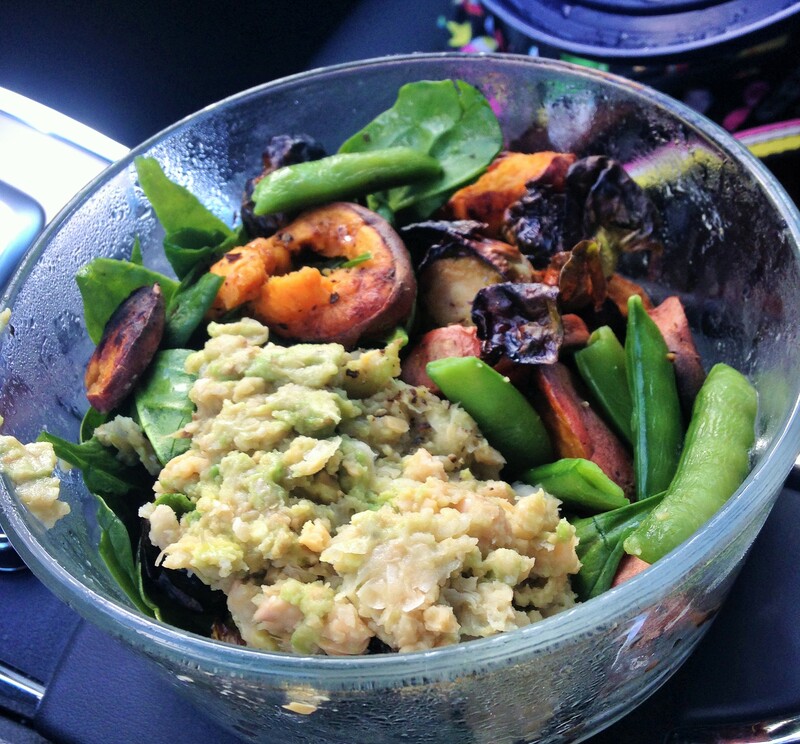 Chickpea avocado mash with roasted sweet potatoes sounds SOOO yummy! It’s delicious and one of my favorite combos! So easy to make, I do it all of the time.